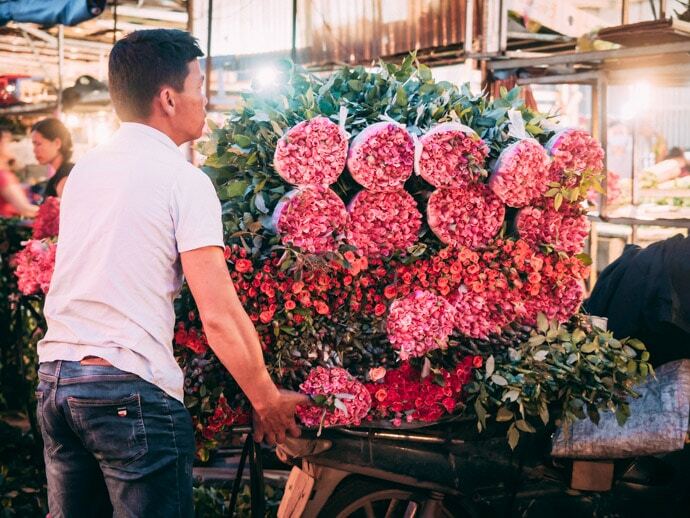 Our early morning adventure to Quang An Flower Market in Hanoi was about so much more than just flowers, although the flowers are magnificent. 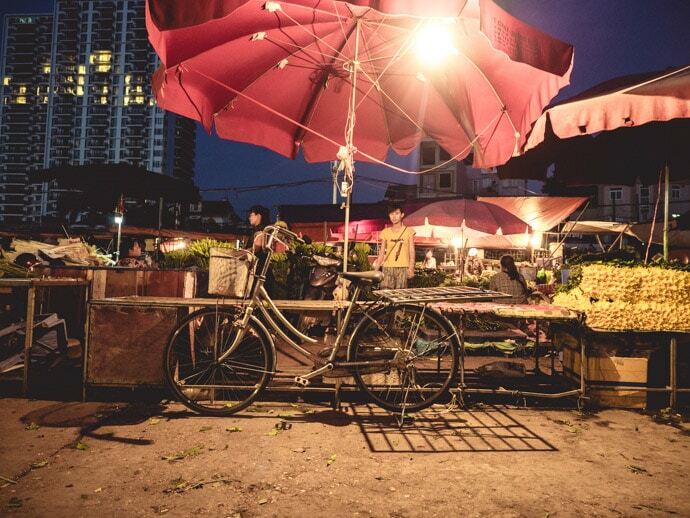 It’s one of the most unique and memorable things to do in Hanoi Vietnam. 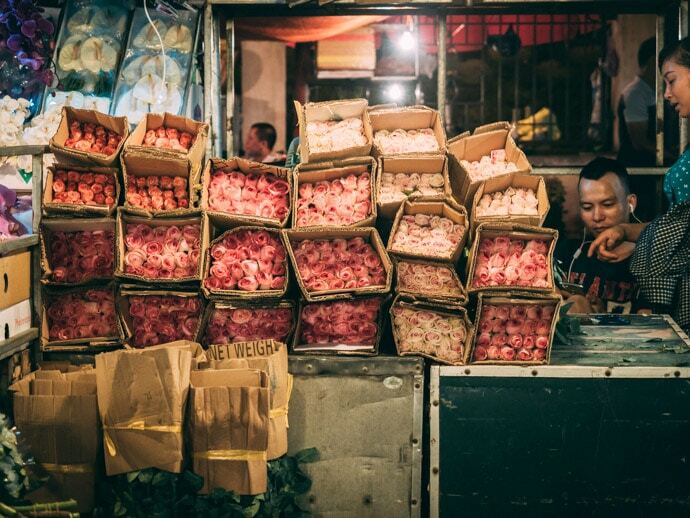 Being a night market just adds to the experience, a place full of local life, motorbikes and flowers. 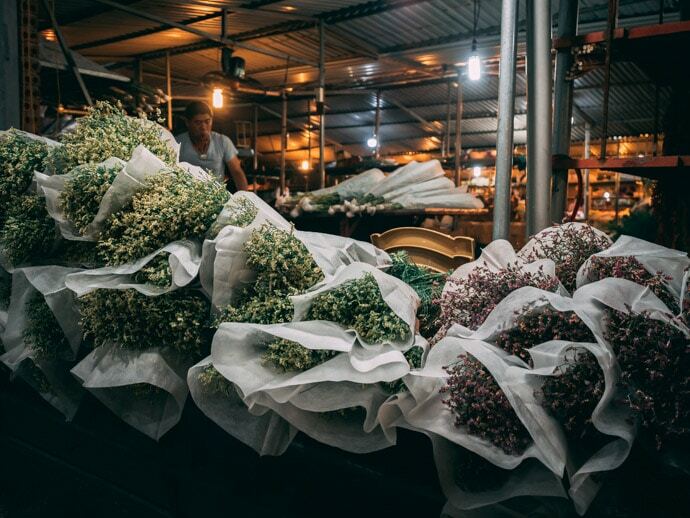 It was on our third time to Hanoi, and almost our last day of our month long stay, that we finally made it to Quang An Flower Market. I’m not going to lie, the idea of a 3 am start really just isn’t appealing. Now, we’re not ones to shy away from an early morning start. Actually, early morning is a beautiful time of the day. But there’s something about getting out of bed at 3 am that just feels wrong. Nevertheless, on one of our last mornings in Hanoi, we mustered up the will, walked out of our little Hanoian abode, down our little alleyway, onto the taxi-less (and unusually motorbike-less) streets. 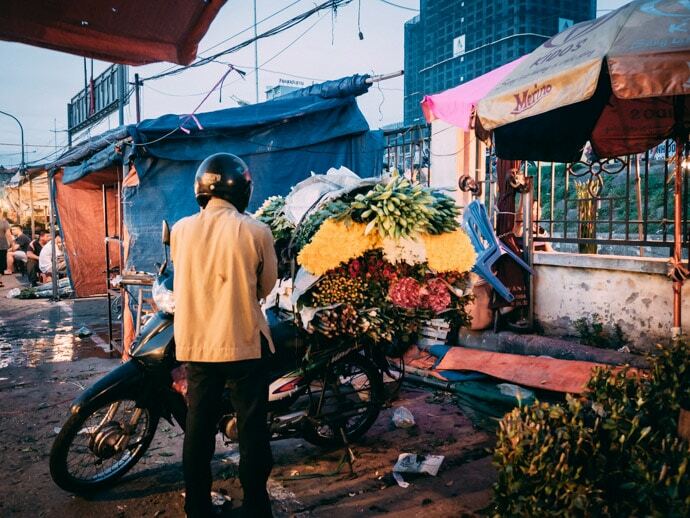 A little tip for visiting the Hanoi flower markets… book a taxi the night before or when you wake. As it turns out, no one likes getting up at 3 am. 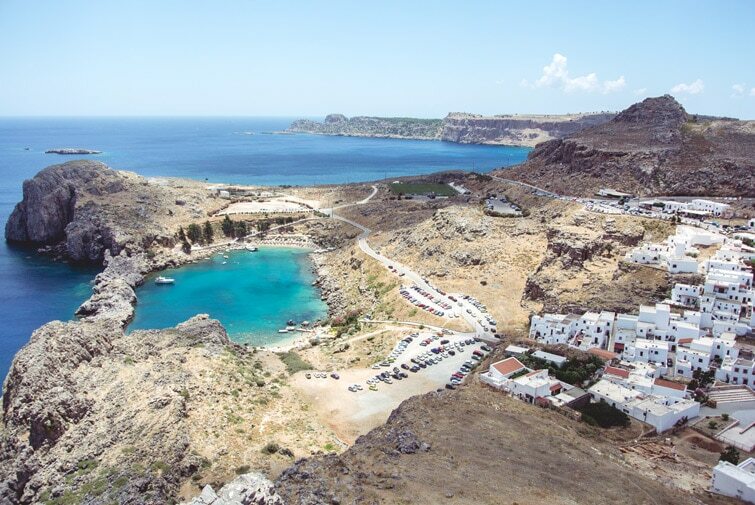 When we finally got our taxi, we took a few wrong turns before making it to the markets. 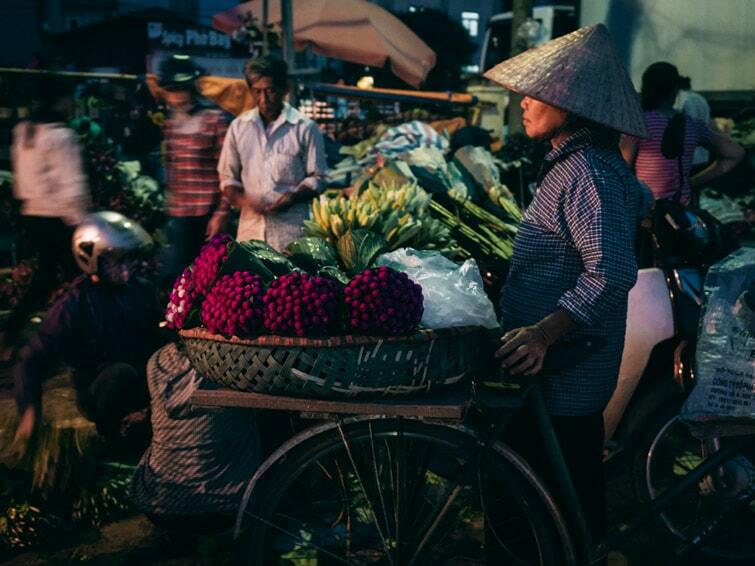 Despite the excitement of exploring the abnormally quiet streets of Hanoi, I have to admit, we were having those moments of ‘Is this really worth it?’ and sleep jealousy. Until we arrived. 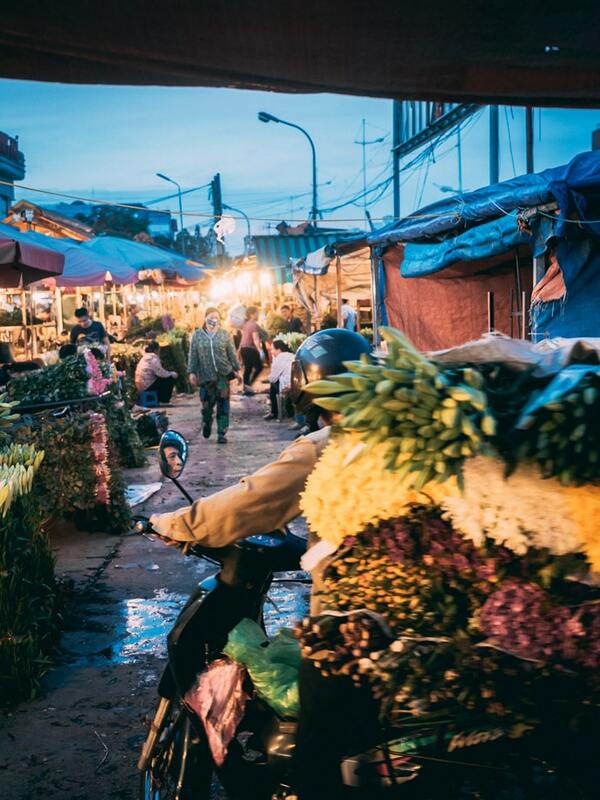 Arriving at the Quang An Flower Markets was like arriving in this beautiful balance of beauty and crazy. 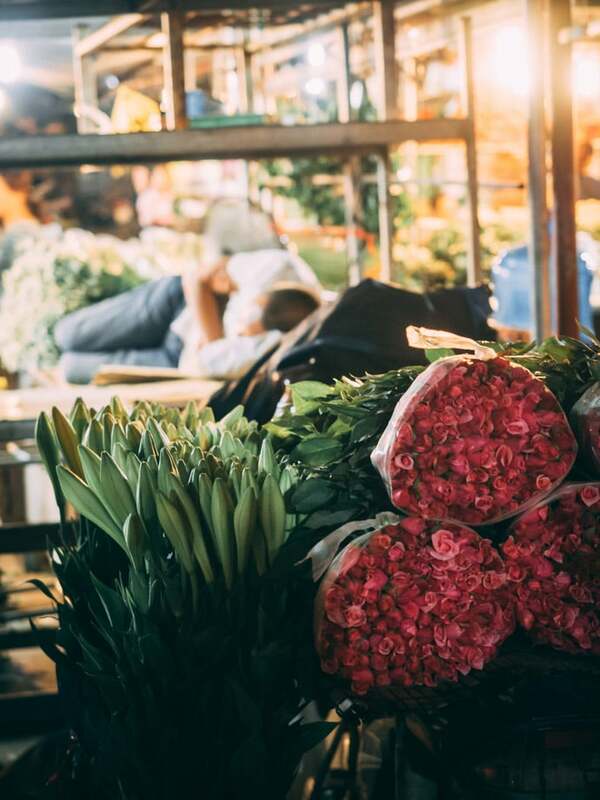 When I think of flower markets I often picture the beautiful flower shops in Paris and people gracefully perusing. 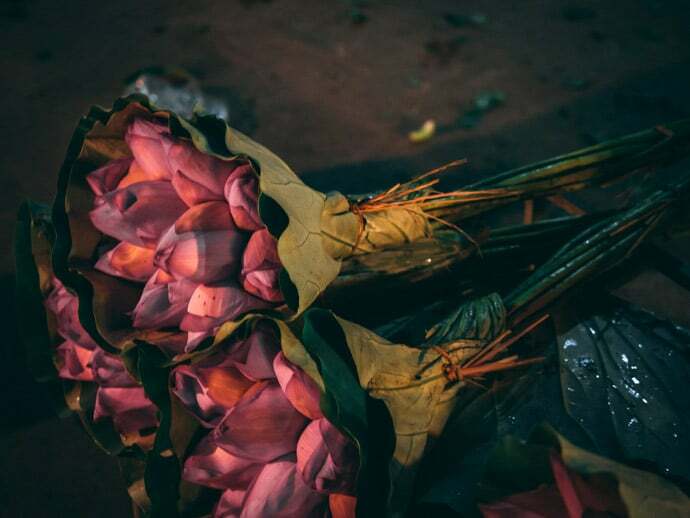 Well, these flower markets are not like that. But in the best possible way. 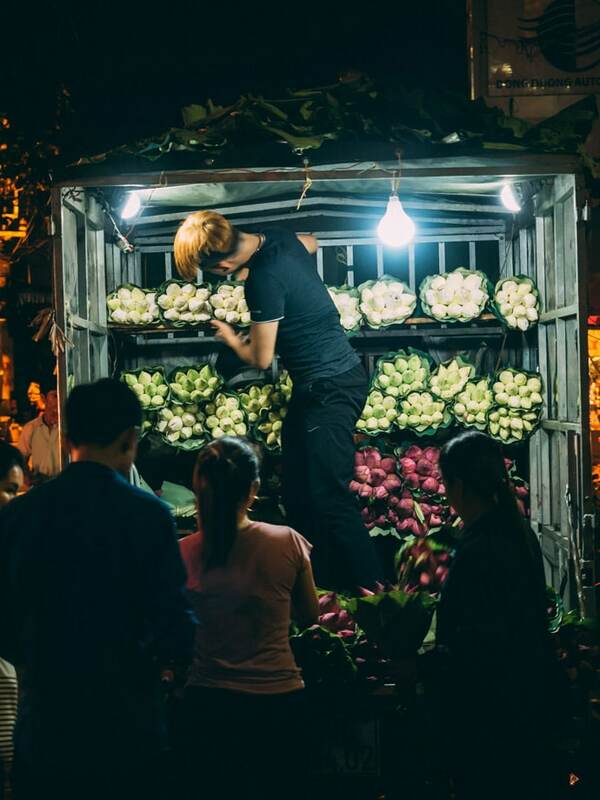 The flower markets in Hanoi, of course, have their own hectic, buzzing atmosphere. The type of energy that only exists in this part of the world. That beautiful craziness where any tiredness you may have been feeling before is long gone. And in its place are giant piles of the most beautiful and unique flowers and motorbikes buzzing down the lanes with even more flowers towering over the rider. It’s a business, a way of life, it’s a community. 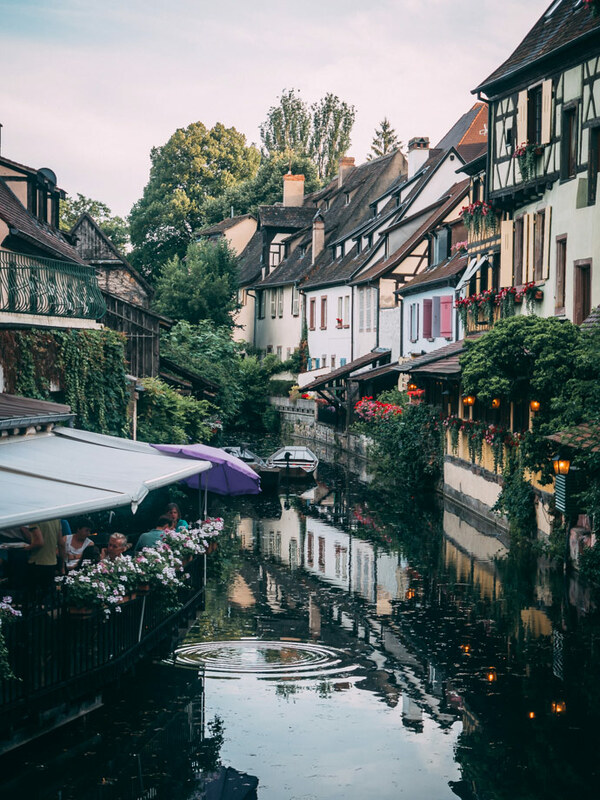 And as I’m happy to walk down each lane multiple times, people watching as much as flower watching, all of a sudden a 3 am wake up doesn’t seem that bad at all. 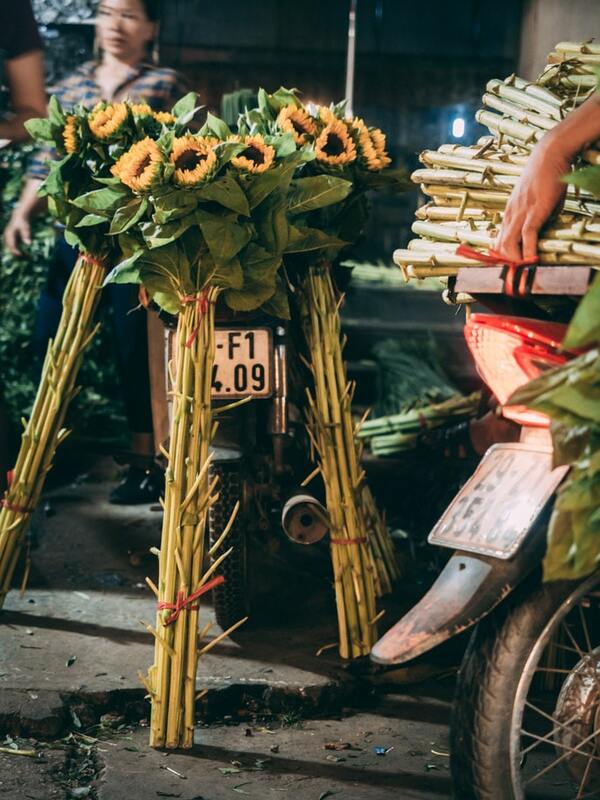 What is the best time to visit Quang An Flower Market? 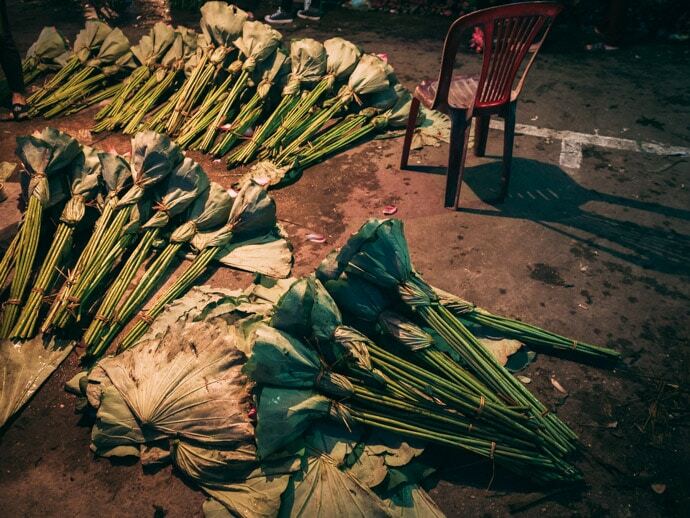 We arrived at Quang An Flower Market around 4.20 AM, everything was buzzing and it was a great time to be there. But it did start to change and become more subdued not too long after we arrived. So I would suggest getting there by 4.20 AM, but 10 or 20 minutes earlier again would be great, just so you have more time soaking up the craziness. 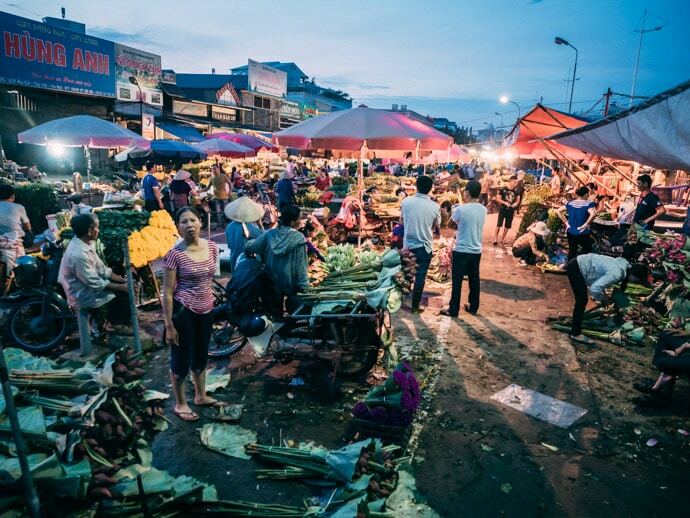 The flower markets are night markets, starting around midnight and ending around 6 am. From our experience and the many reviews we read before going, its the 2 am to 4 am period that has the most action and atmosphere. 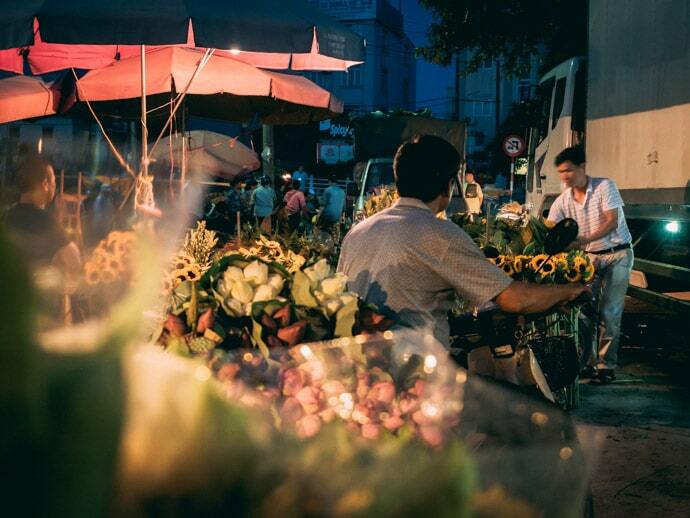 How to get to Quang An Flower Market? 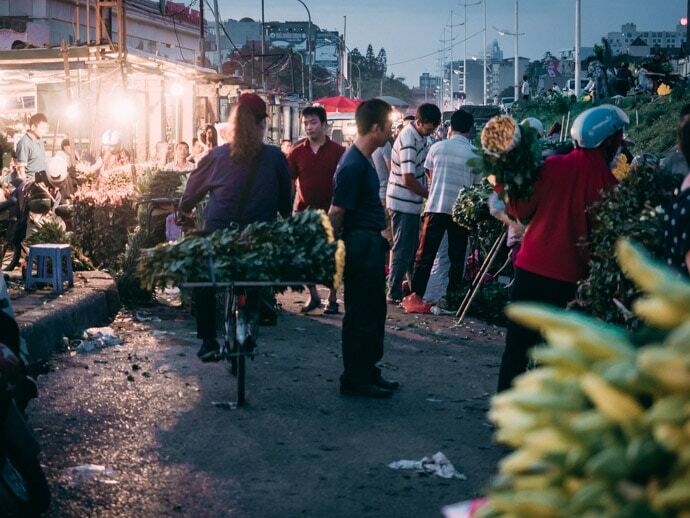 Quang An Flower Market is in the Tay Ho district in Hanoi. 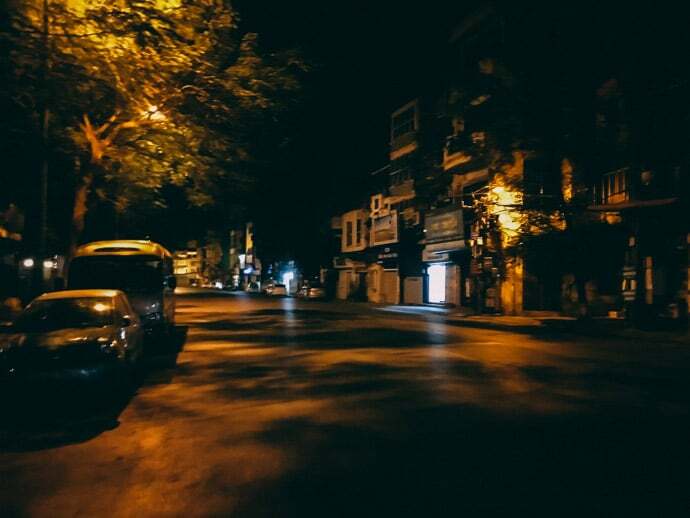 It’s not exactly near Hanoi’s French Quarter or Old Quarter so you will definitely need a taxi due to the distance and time you need to visit. This is a long road, so you may need to ask for the intersection of Âu Cơ and Ngõ 238 Âu Cơ. 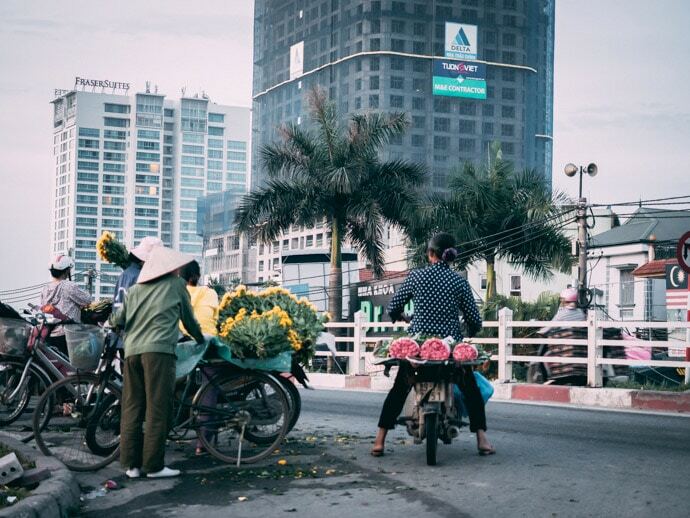 In Vietnamese, the flower market is called chợ hoa Quang An. 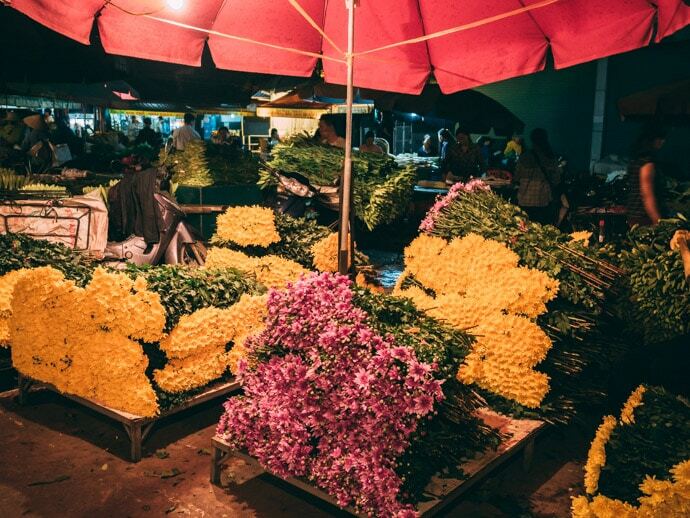 Is Quang An Flower Market worth the visit? 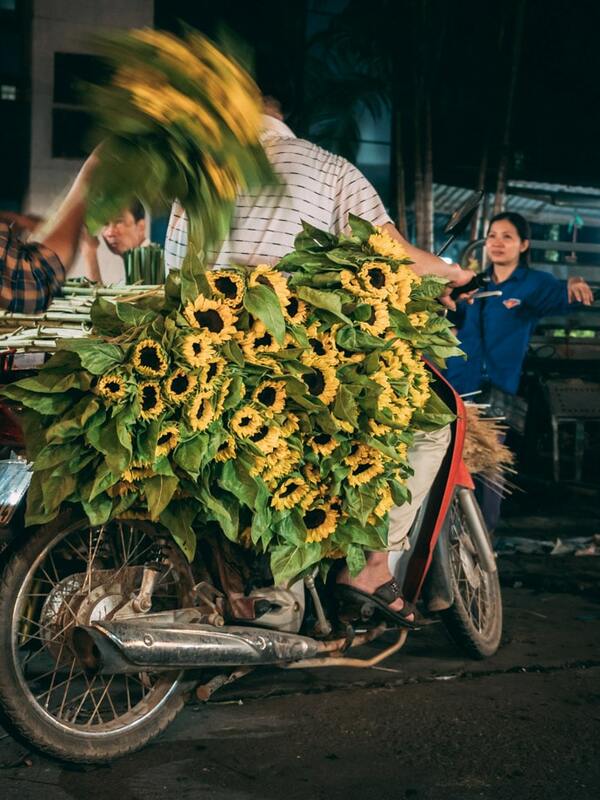 It’s definitely worth the early start to see not only the flowers but a completely different look at Hanoi and Vietnamese life. 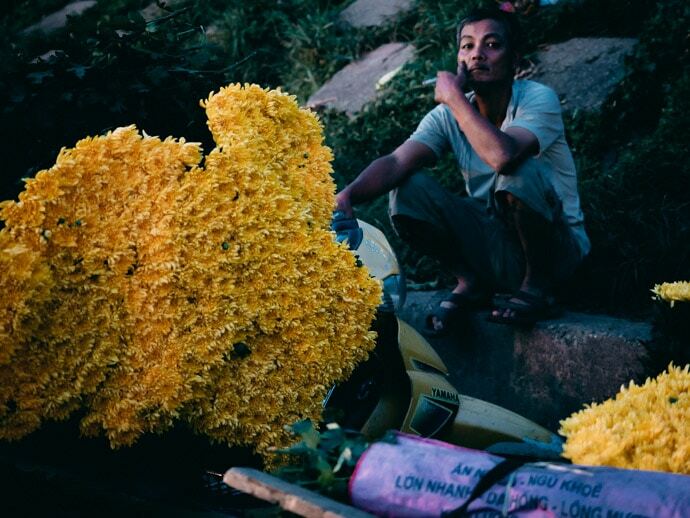 You will see the quiet streets of Vietnam, the beautiful and unique flowers literally piled up, motorbikes overflowing with flowers and people going about their daily life.